To be a safe driver you need to know what’s going on all around your vehicle. Not looking properly is a major cause of accidents. All drivers look ahead; but many don’t look far enough ahead. Importance of Looking Far Enough Ahead. Because stopping or changing lanes can take a lot of distance, knowing what the traffic is doing on all sides of you is very important. You need to look well ahead to make sure you have room to make these moves safely. How Far Ahead to Look. 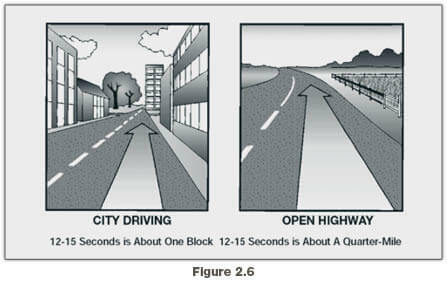 Most good drivers look at least 12 to 15 seconds ahead. That means looking ahead the distance you will travel in 12 to 15 seconds. At lower speeds, that’s about one block. At highway speeds it’s about a quarter of a mile. If you’re not looking that far ahead, you may have to stop too quickly or make quick lane changes. Looking 12 to 15 seconds ahead doesn’t mean not paying attention to things that are closer. Good drivers shift their attention back and forth, near and far. Figure 2.6 illustrates how far to look ahead. Look for Traffic. Look for vehicles coming onto the highway, into your lane, or turning. Watch for brake lights from slowing vehicles. By seeing these things far enough ahead, you can change your speed, or change lanes if necessary to avoid a problem. If a traffic light has been green for a long time it will probably change before you get there. Start slowing down and be ready to stop. It’s important to know what’s going on behind and to the sides. Check your mirrors regularly. Check more often in special situations. Mirror Adjustment. Mirror adjustment should be checked prior to the start of any trip and can only be checked accurately when the trailer(s) are straight. You should check and adjust each mirror to show some part of the vehicle. This will give you a reference point for judging the position of the other images. Regular Checks. You need to make regular checks of your mirrors to be aware of traffic and to check your vehicle. Traffic. Check your mirrors for vehicles on either side and in back of you. In an emergency, you may need to know whether you can make a quick lane change. Use your mirrors to spot overtaking vehicles. 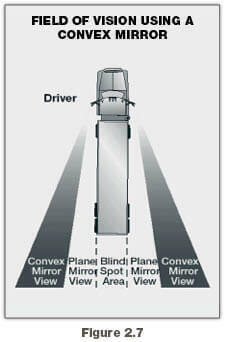 There are “blind spots” that your mirrors cannot show you. Check your mirrors regularly to know where other vehicles are around you, and to see if they move into your blind spots. Check Your Vehicle. Use the mirrors to keep an eye on your tires. It’s one way to spot a tire fire. If you’re carrying open cargo, you can use the mirrors to check it. Look for loose straps, ropes, or chains. Watch for a flapping or ballooning tarp. Special Situations. Special situations require more than regular mirror checks. These are lane changes, turns, merges, and tight maneuvers. Before you change lanes to make sure there is enough room. After you have signaled, to check that no one has moved into your blind spot. Right after you start the lane change, to double-check that your path is clear. After you complete the lane change. Turns. In turns, check your mirrors to make sure the rear of your vehicle will not hit anything. Merges. When merging, use your mirrors to make sure the gap in traffic is large enough for you to enter safely. Tight Maneuvers. Any time you are driving in close quarters, check your mirrors often. Make sure you have enough clearance. How to Use Mirrors. Use mirrors correctly by checking them quickly and understanding what you see. When you use your mirrors while driving on the road, check quickly. Look back and forth between the mirrors and the road ahead. Don’t focus on the mirrors for too long. Otherwise, you will travel quite a distance without knowing what’s happening ahead. Many large vehicles have curved (convex, “fisheye,” “spot,” “bugeye”) mirrors that show a wider area than flat mirrors. This is often helpful. But everything appears smaller in a convex mirror than it would if you were looking at it directly. Things also seem farther away than they really are. It’s important to realize this and to allow for it. Figure 2.7 shows the field of vision using a convex mirror.